This entry was posted in Racing on November 17, 2008 by Steve Tilford. It seems like the weeks are going by soooooo…. fast. When traveling all day Mondays and Fridays there seems no time to do anything else. Including much training. Which is weighing heavily on my mind. Not doing the stage race in New Zealand this year kind of puts me more at the mercy of the weather for fitness the next few weeks until Nationals. Anyway, The Mercer Cup weekend was a new event for me. It is in Princeton New Jersey. A very old nice town. The course was pretty flat. But, not flat enough for the conditions. The mud kept getting deeper and deeper. It was pretty unrideable in sections both days. Running downhills because of the mud depth isn’t something anyone wants. Saturday went badly. I got a pedal in my wheel early in the first lap. I stopped and unhooked by brake straddle cable and kept riding. I was pretty far back in the 20’s when I got to the pit. But, I only had wheels there, no bike. So I decided to just keep riding since brakes were virtually not needed. The riders going through the pits and exchanging bikes were gaining an enormous amount of time. Maybe 10 seconds. Probably more. The pit was rideable and the parallel course was walking in ankle deep mud. It pretty much destroyed my motivation for racing. I figured it was over 2 minutes at the minimum. Half way through the next lap I convinced myself that it would be the best thing for the weekend to stop and go and try to find some spokes for my light carbon wheels. I hate quitting races, especially when there isn’t any real reason to stop, but I didn’t regret this decision. Sunday I arranged to get a spare bike from SRAM. I only had to supply some Shimano pedals. But my mistake was to not set the bike up myself. I got a pretty cruddy start, but I knew from the day before, the race was going to drag on for ever. The course was better in some places and worse in others. There was a pretty long run, over 100 meters up a slight grad and then back down the other side. It got a bit better the last few laps and you could ride most of it. Switching bikes after half a lap was a disaster. The seat was way too high and the brake levers way to low. I flailed the next half lap and lost a ton of time. 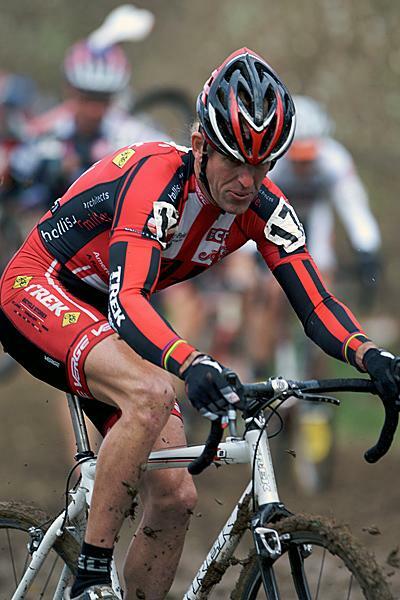 By the time I got back onto my bike I was barely racing for any UCI points (top 15). I got going a few times, but kept destroying any chances by throwing myself on the ground or having help throwing myself on the ground. Anyway, I had some epic contact with the mud. The most memorable would be the guy that was cutting one of the wind blown banners down and had it wadded up in a ball. Right when I got up to him, he was in a rush trying to cut the last zip tie and decided to throw the rest of the banner right between my brake levers and top of my front wheel to free up his hands. Needless to say, that didn’t go too well for me. Whatever. I’d already broken off my fair share of plastic post holding the ribbon. The only line on alot of the course was where the ribbon was blowing off the course and it allowed you to ride out of the deep mud. But you still had to come back and ride around the posts. Sometimes that didn’t go as planned. I ended up finishing 17th. I was OK with that. Better than I should of done. I was riding/running pretty good. I just made a thousand mental errors. 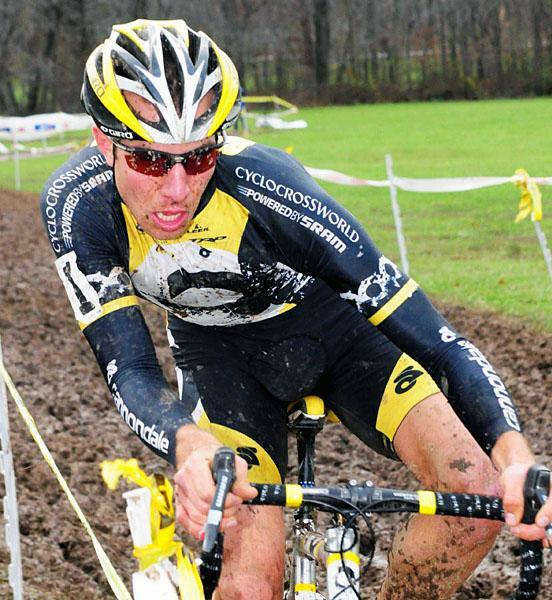 That isn’t a good thing cyclocross racing in the mud. So, I’m OK with the results. Bill Marshall and Chris Wallace helped me out a ton in the pits on Sunday. It is much harder working the pit than racing. And Chris had already raced the junior race. He is leading the USGP series after the first two weekends. 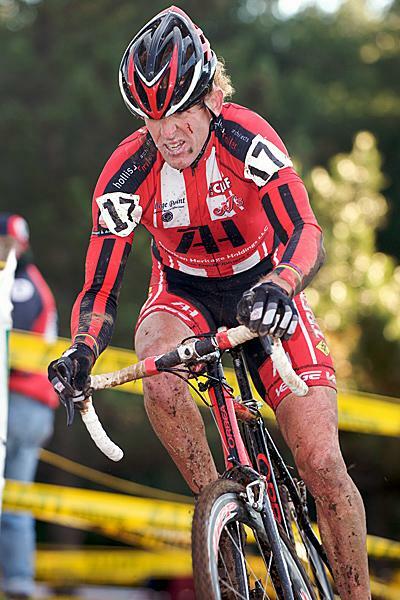 That is pretty cool having a local KC rider leading a prestigious National series! I’m off to North Carolina Friday morning. It’s amazing there are only 3 weekend left until Nationals in KC. Jeremy Powers hugging the ribbon. 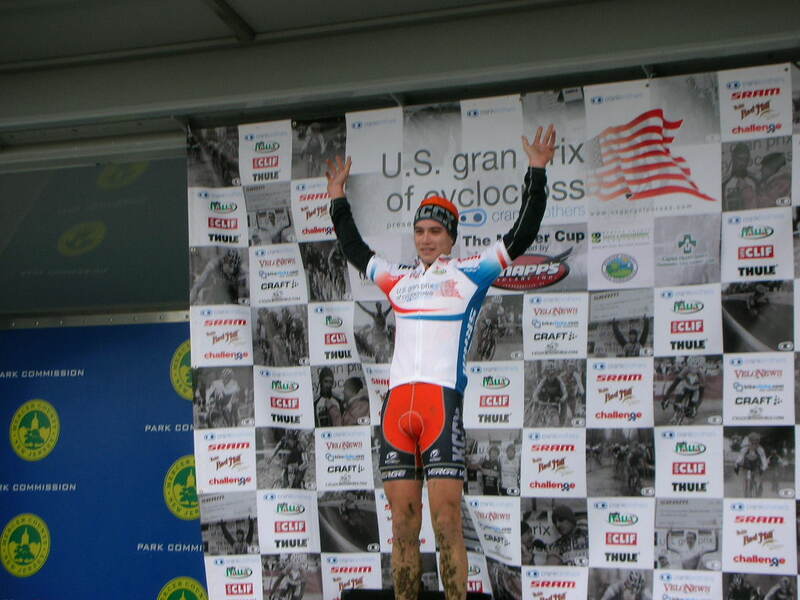 Chris Wallace, awards podium, leaders jersey.